I visited the de Young Museum in San Francisco in late December, 2009. This post is long overdue, I know, but I still felt the need to post my experience. For New Years, I made a quick trip to SF before the new school term. At the last minute, I quickly looked up the local museums to see if any exhibits caught my eye. Lo and behold, the de Young was hosting the Tutankhamun exhibit! Oh. My. God. Like many children, I had a major Egypotology phase. That is normal, right? I was obsessed with everything to do with ancient Egypt. The culture, the religion, and of course – the artwork. I knew this was a once in a lifetime opportunity for me, and plan was made. Unforunately, no cameras were allowed inside the Tut exhibit, so the photo to the left is all I have to prove my experience. I have to say, it was amazing. Ah-ma-zing. The objects from Tut’s tomb were really only a minor part of the entire exhibit. Several rooms were filled with pieces from earlier burials, which really gave the audience a great background in the stylistic history before entering Tut’s area. If anyone can make this exhibit (it leaves on March 28th as seen in the sign), I would highly recommend it. If not, try to catch it sometime in your life. Even for those who didn’t spend childhood creating Papyrus from scratch, it is still a magnificent sight. 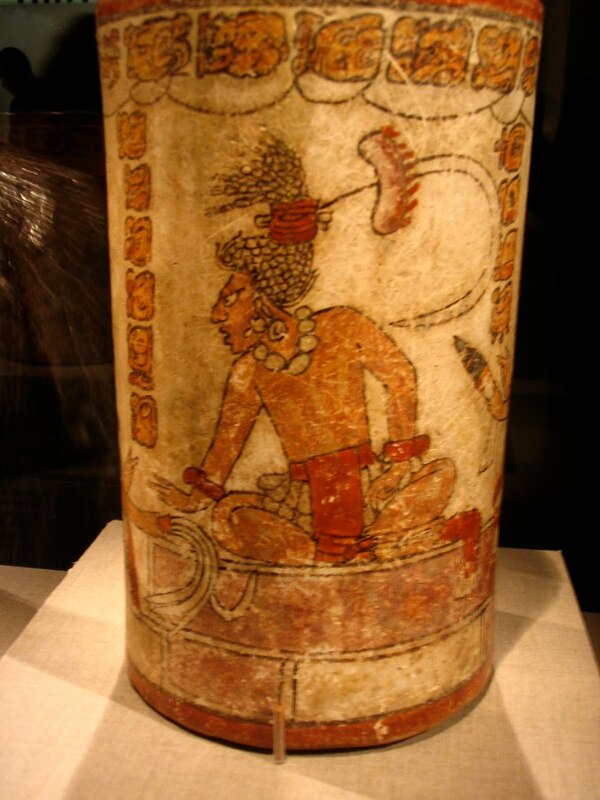 The Maya are known for their incredible ceramic vessels, and this one in particular caught my eye. It’s from the Classic period, dated to about 600-900 CE. As you may be able to gather from the following images, it depicts a sacrificial ceremony. 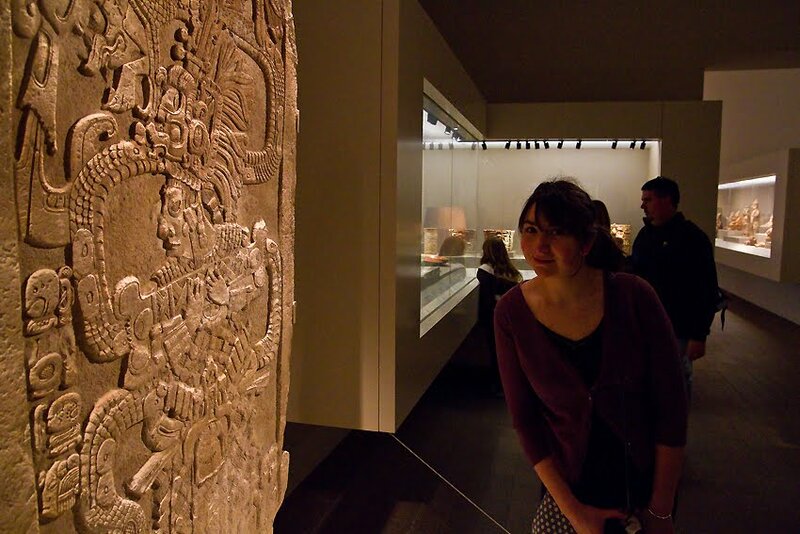 Another favorite was a stela from the Guatamala/Belize area dated to 761 AD. The stela depicts Queen Ix Mutal Ahaw. 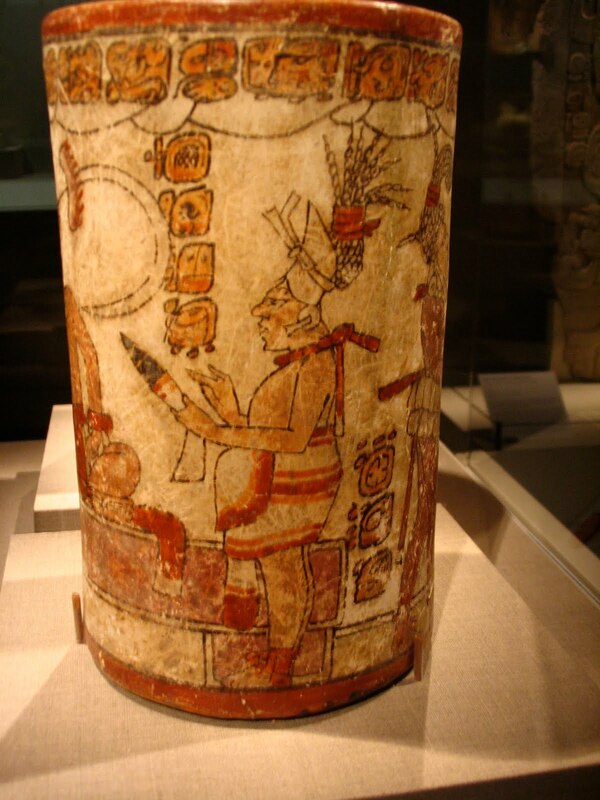 I don’t know a lot about this figure in particular, but this stela is a perfect example of what I love about Maya public sculpture. The power radiating from this image is incredible. You can check out the rest of my photos from this exhibit on my Flickr. you should write this kind of thing professionally and make $ cause this is hella cool. Did you guys try the cafeteria? One of those inexplicably exquisite museum cafes. I liked the South Pacific stuff as well.